So you are now prepared to install your portable hot tub. You understand the benefits of having a tub in the house, you have done your research and have found the right choice that you deem perfect for you. Your tub must not be close to any power line. Never place your hot tub near an electric outlet. The foundation under the hot tub must be very strong. The foundation has to be level. The grass is definitely one of the most used surfaces under a blow up hot tub. And why not? If not contaminated with broken glass or wooden sticks, it makes an awesome cushioning material. However, the ordinary ground is not such a good insulator. Try to use a ground cloth or an air mat under the hot tub, both for heat insulation and puncture protection. It must be level. This is to avoid any kind of settling after you install your tub. The thickness of your concrete pad must be within the specified limit allowed in the community where you live, provided there is any law that relates to the construction and installation of tubs in that community. If there are no such laws, the concrete pad must have a minimum thickness of 4 inches. This is to adequately support the weight of the tub, the weight of the water to be put in the tub and the weight of the persons that will be making use of the tub. The size of the pad should be approximately equal to the size of the tub. This is to conquer any accessibility issue. You should have constructed your concrete and ensure that the concrete would have dried before the delivery of your tub. This is important because you can immediately install your tub and start making use of it right away. If you find any or all of the construction characteristics stated above to be intimidating, you can call on any home improvement service provider in your neighborhood. If this service is not readily available, you can collaborate with your plumber and work it out together. 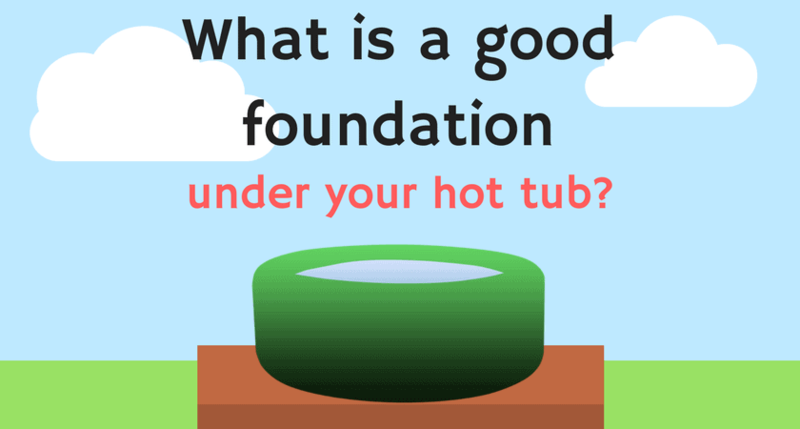 This type of foundation is recommended especially if your tub is to be situated outside. Try to install low-level showers around the tub. This is to ensure that you can wash your feet before entering the tub which will prevent dirt in the tub. There is no need to pour concrete or work out any other thing like that. You can easily dismantle the pad if the need arises. For example, in case you want to move out of your present location to another one.